… but, not for long. I have become obsessed with lotteries! Not in participating … I don’t: I recently refused to buy a $7 ticket to a $20 million+ lottery; the vendor thought that I was crazy, but he was crazy. There are government-sponsored anti-gambling ads running on Australian television right now that show that you have around twenty times the chance of a number one record as you do to win the biggest jackpot on a slot machine … lotteries are worse, much worse. Yet, I can understand the temptation because the prizes are so large. 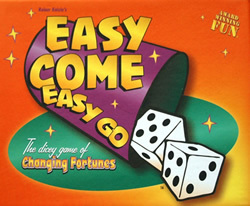 My interest actually has to do with my ‘easy come, easy go’ thesis: I believe that in order to keep a large sum of money, you have to make it slowly (so that you can learn the necessary financial lessons along the way) … by slowly, I mean years – say, 7 – not days. Nora Moon, validations supervisor with the Virginia Lottery, has dealt with almost every lottery winner since the lottery began. Estimating how many Lotto winners have gotten into financial trouble is impossible, she said. Steve Danish, a Virginia Commonwealth University psychology professor who has counseled Virginia Lottery winners, said one-third of about 40 winners he talked to in a seminar several years ago asked questions indicating they were in financial trouble. More than half the Lottery winners are happier now than they were before their win (55%). Most of the other winners claim that winning the Lottery has not affected their level of happiness, largely due to the fact that they were happy before their win. Only 2% of winners were less happy. The happiness of the winner is not affected by the size of his or her win. Of the winners who are happier (55%) around two thirds claim one of the reasons is improved financial security and fewer worries (65%). A further 23% either stated that they can buy what they want now or that life is generally a lot easier. The large majority of Lottery winners have not experienced any negative effects on family life or friendships. I forgot to mention that this survey carried out in 1999 by MORI, marked the 5th birthday of The National Lottery and the findings “represent the most complete snapshot of the generation of Lottery winners who have emerged since the first draw on 19 November 1994”. That’s a 44% depletion of winnings during a 5 year period or, on average, after just 2.5 years! Happy => Rich => Happy => Spend => Broke => Happy or Devastated … you decide? so the next question is, how can you be happy if you keep everything for yourself? What does “happy” mean? A slight revision of my prior response, which now fully supports your ‘easy come, easy go’ thesis: People who have not had TO EARN a substantial sum of money don’t comprehend fully how to handle it, and so liquidate it much more quickly and easily than they would otherwise expect. @ TECHNOmancer – Interesting: is it the EARNING or the TIME it takes to accumulate that does the trick? Perhaps, both? I agree with TECHNOmancer – you appreciate something a lot more when you’ve had to sweat for it. On time, presumably it is a bit like delayed gratification – people who can wait a bit before spending tend to do much better financially than those who spend whenever the impulse strikes them. If it takes time to earn the money, almost by definition you have to delay the gratification (or run up consumer debt) – if you win a lottery you don’t have that discipline. Here’s question – of the lottery winners how many had good savings rates and how many simply lived from paycheque to paycheque? I wouldn’t mind betting that there is a decent correlation between pre-win financial habits and post-win depletion rates. I read in the paper today that Elon Musk (Space X, Paypal, Tesla Motors) – model for Tony Stark in Ironman – is essentially cash broke. He has illiquid assets in investments but needs to borrow cash from friends to pay the bills.